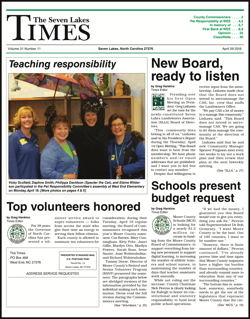 The April 29 edition of The Seven Lakes Times is now available for download in pdf format. You can download a high-quality PDF here, or, if you have a slower internet connection, download a smaller PDF here. - Newly elected SLLA President Greg Lishawa says the past is the past and the newly-constituted Board of Directors aims to get things done efficiently, while making sure to listen to input from the membership. - Former SLLA President Steve Ritter told the Board that the resounding defeat of a proposed $35 dues increase was a protest by members who felt the Directors had decided to build the new pasture fence and get rid of lifeguards without regard to input from the community. - The SLLA Board approved a new set of rules for pool operations, in anticipation of an expanded pool season utilizing a new electronic access system and attendants rather than lifeguards. - SLLA Lakes & Dams member Bob Miller helped a couple of Foster Lakes experts sample fish populations in all the SLLA lakes. Early results suggest a lack of food fish for the bass, despite the fact they pulled a 23-inch largemouth out of Lake Echo. - Moore County Schools Superintendent Dr. Bob Grimesey presented the School Board's request for a nearly $1.3 million increase in County funding to the Board of Commissioners. - Chairman Picerno made it abundantly clear that the responsibility for funding school operations belongs to Raleigh -- despite the fact that Moore County taxpayers currently foot the bill for 311 MCS positions. - Commissioner Randy Saunders said the number of positions funded locally had grown by 22% since FY2009. - The Commissioners honored Moore County's top volunteers during their April 19 meeting. - A conditional use rezoning for a solar farm on Airport Road was turned back to give family members — owners of adjacent parcels — an opportunity to work out their differences. - West End Elementary fourth graders took the Pet Responsibility pledge. We have photos. - First Bank execs gave WEE fourth graders a primer on budgeting and saving. Janna has the story. - Harry looks for the face of God in the face of recent disasters; Bob Miller has some thoughts on the economics of people versus technology; Bob Carpenter thinks Foxfire Village should learn to live within its means; and lots of folks want to thank you. Download the high-quality PDF edition (or, if you have a slower internet connection, download a lower-quality pdf edition) and read it all this morning, pick up a copy at locations all over Seven Lakes this afternoon, or check your mailbox tomorrow.